Even with the simplest of setups, audio recording for film is no easy task — especially when the whole picture has to be shot in a day. I was recently approached by aspiring director Sam Heydon to record the sound for a short film he had written. 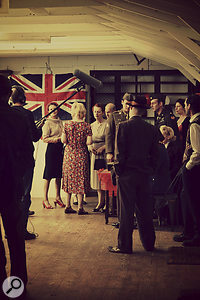 The story of The Nearness Of You was set on Valentine's Day during World War II, and most of the scenes featured a dance hall full of extras in period clothes and service uniforms. 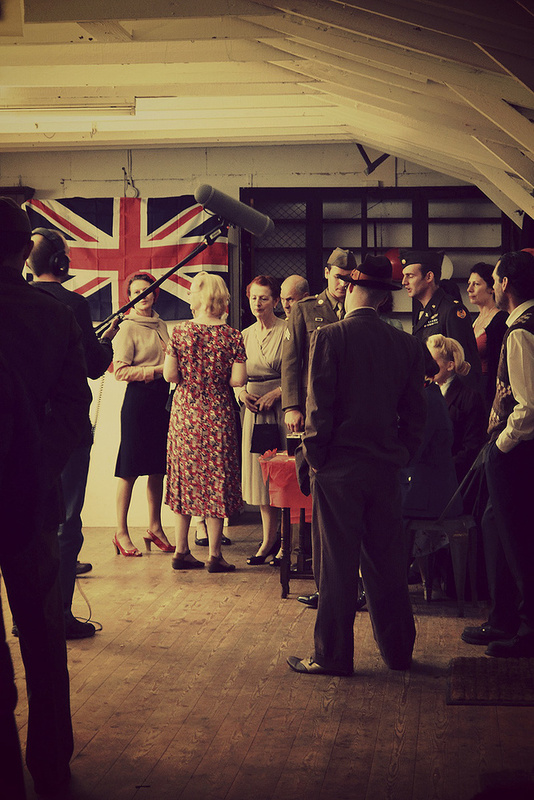 Sam had hired an old village hall that looked the part, but filming had to be done in one day, chiefly because many of the extras were war re-enactors and the limited budget meant that hiring them for longer was not possible. 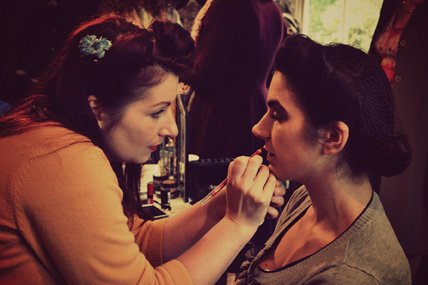 Consequently the production schedule, which also included enough time for a period make-up and hair specialist to style the lead characters, was very tight indeed. My task was to capture ambient and incidental sound, which included the sound of dancers, chattering crowds, a motorbike and a live band, as well as all of the actresses' and actors' dialogue. There was to be a break for dinner in the evening, and a final outdoor queue scene needed to be filmed before utter darkness fell upon us. Then we had to vacate the hall, taking down the blackout curtains and decorations, and returning the upright piano that we'd borrowed for the live band. A Canon DSLR, fitted with a selection of prime lenses, was being used for filming, but there was no requirement for me to sync my audio. For synchronisation purposes, we were using a simple non-digital wooden clapper to create an audio spike. Ultimately, this allowed the editor, who was also the DOP (director of photography), to line up the start of the audio with his visuals. I wasn't there for the edit, but in the past I have used handclaps to create transients that can be matched with the correct frame when lining up audio and video in Sony's Vegas for YouTube broadcast, and it is pretty easy to do. There is a possibility that non-timecoded audio might drift out over time, but providing the cues aren't ridiculously long, it won't be a problem. The fact that synchronisation was not required meant that a lightweight and portable handheld digital recorder with a reasonable specification would be adequate for the job. 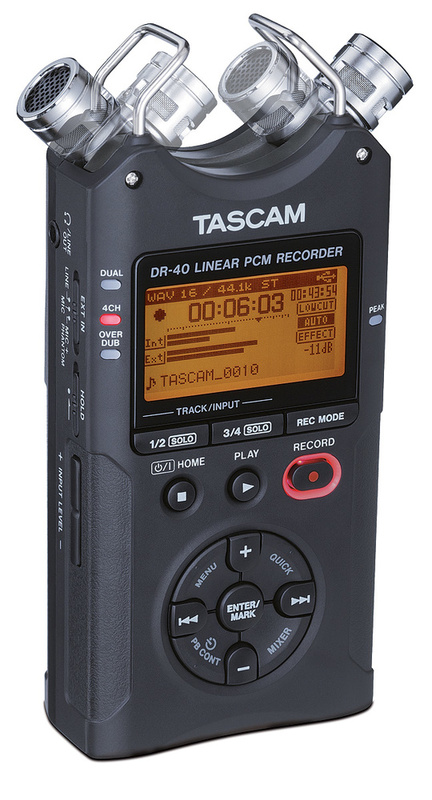 At the time I was in possession of a Tascam DR40, which I'd reviewed for Sound On Sound and was very familiar with, so I decided to use it for the project. Though the built-in mics on handheld recorders can be high quality, they're unlikely to be appropriate for this kind of project, especially as they can be susceptible to handling noise. 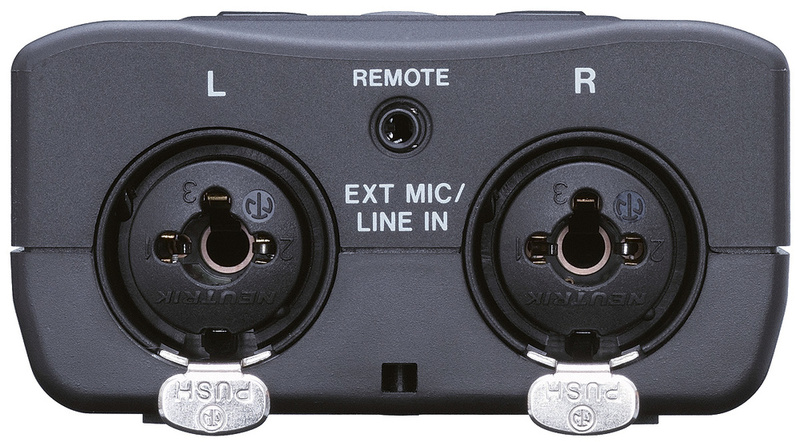 Picking one with XLR inputs will allow you to connect external mics, giving you far greater control over the sounds you capture. The DOP promised to bring along the slightly more expensive Zoom H4N, which would have done the job just as well (and in recent years has become a favourite sound-recording device for budget film-makers), but I had no prior access to the H4N to check that it was all in working order, so I ended up using the Tascam and keeping the Zoom recorder handy as a backup in case of failure. I also had an Olympus LS5, which records audio just as well the above products, but I bought it for recording artist interviews, rather than music applications, and it lacks the all-important XLR inputs and phantom power necessary for running external capacitor mics. 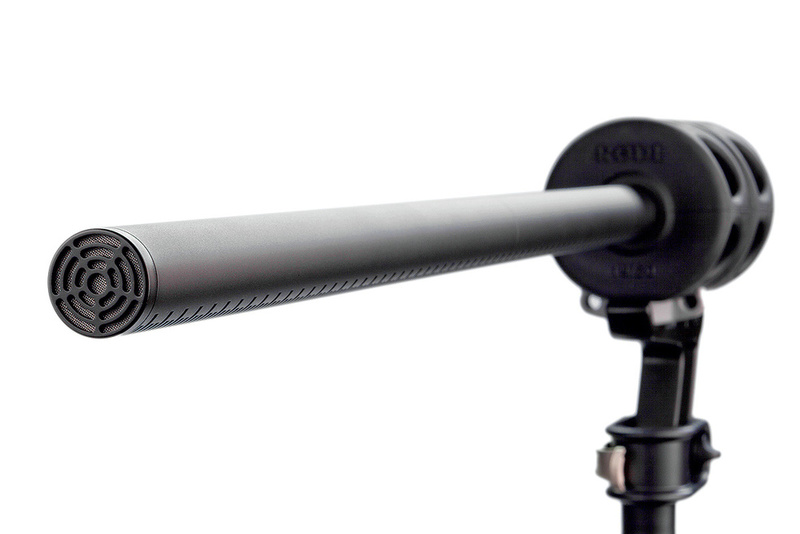 It has onboard mics, but even the most expensively constructed handheld recorders suffer from some degree of handling noise, rendering the mics fairly unusable in many situations. As for budget products like the DR40, their shielding is minimal and any brush of the hand on the casing will ruin a take. Using external mics eradicates this problem entirely, so it was always my plan to set up separate mics. To give myself options, I took along as many high-quality studio mics and cables as I could fit into my gig bag, but I was relying on the production team to supply a boom mic for capturing the actors' dialogue. I also took along a set of Sony MDR7509 closed-back reference headphones, which provide plenty of level and isolation. These are desirable characteristics if the environment is a little noisy, especially when checking the quality of the last recording between takes, or when monitoring the quality of dialogue during takes. An important thing I needed to check before filming was what sample rate and bit depth the production team required. It is very easy to forget to set such things, or to make assumptions about what's required, so I wanted to avoid any issues and set my recorder up in advance. 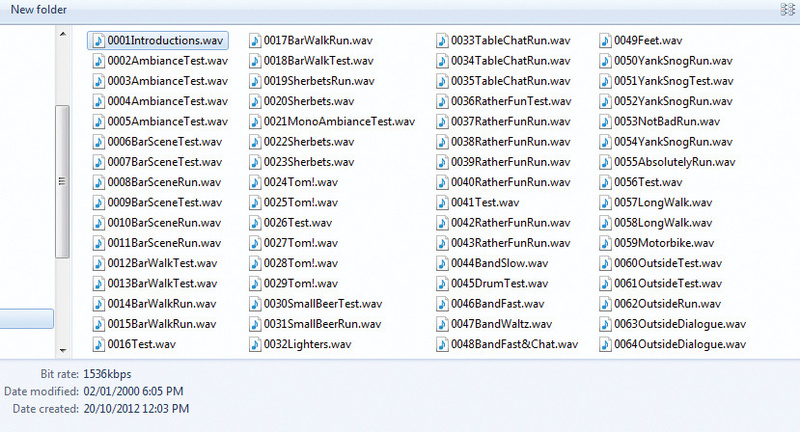 In this case, I was asked to provide 16-bit files recorded at the industry-standard sample rate of 48kHz. I also engaged the limiter on the Tascam DR40 to take care of any random level spikes, but intended to err on the side of caution and leave plenty of headroom at all times. The first thing I did on arrival at the venue, where various extras and actors were beginning to gather, was set up two microphone stands, each holding a phantom-powered Groove Tubes GT44 pencil mic at head height, so that I could begin capturing the noise of crowds gathering in the room. Given that the hall had a wooden floor that moved as people walked on it, it was vital that my mics had their own shockmounts. I chose mics with cardioid patterns so that they would have some directionality and, when used as a stereo pair, would give a sense of space in which the extras and actors were moving. Ideally, I'd have placed the mics equidistant from the action in each scene, but the positioning of the lighting was more critical and took precedence. Throughout the filming the walls of the hall were 'blowing the highlights' (the light reflecting from the walls was exceeding the dynamic range of the camera), so a lot of time was spent setting up screens and moving lights, and I had to work around the Lighting Technician's activities, as well as that of the DOP. One unexpected problem was caused by a bee, which had woken from hibernation in the rafters and seemed fascinated by the warm lights! Unfortunately, this meant that it spent a long time buzzing right above my microphones, which they picked up very clearly. Although we tried and failed to remove the bee, the scene it was affecting only involved general hubbub rather than 'lip-sync' dialogue, so there was enough audio from the various takes to work around the loud buzzes! For the rest of the day we alternated between scenes requiring stereo room sound and those involving dialogue, so a lot of swapping back and forth between the GT44s and the mono boom mic had to be done. Fortunately for me, though, we were filming something where the look was very important, so it took longer to set up lights and camera positions than the sound equipment, which meant there was always ample time for me to switch connections and reset the DR40. My stereo mics had their own, slightly unwieldy, phantom power supplies so I had to set the DR40 to stereo and turn its phantom power off whenever I switched from dialogue to ambient sound recording. Apart from one annoying menu setting that defaulted to a preset state and had to be re-applied each time I swapped over, it was very simple to do, and I also had time to make test recordings while the camera and lights were being sorted out. Another option available to me would have been to use the DR40 for dialogue and the Zoom H4N for ambient recording, or vice versa, but when you are working in a hectic situation with lots of distractions, having fewer variables to deal with means that there is less chance of making a mistake, so I stuck with the one device. On that note, I find that the fewer bells and whistles a product has to get in the way, the better. Clear metering is vital when setting safe levels in a rush, or in poor lighting, and the most frequently used buttons, such as the transport controls, should not be fiddly or easy to nudge by accident. 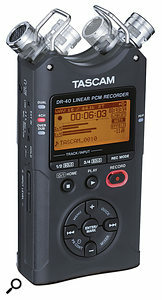 Before filming I did consider using a portable recorder with more XLR inputs, such as Tascam's DR680, so that I could record the ambience and dialogue at the same time, but in retrospect, doing that would have been impractical with so many people milling around, and ultimately proved unnecessary. A shotgun mic is pretty much an essential bit of kit for certain situations: in this case, picking out dialogue against background chatter. 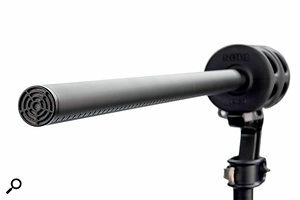 The boom kit brought by the production team comprised a lightweight extendable pole attached to a wind basket containing a suspension-mounted directional Rode mic, which I believe was the lightweight NTG1 shotgun model. The assembly turned out to be perfect for recording the dialogue, as it was light enough to hold and control with one arm and captured a good level from a few feet away.Most importantly, the directionality was not so extreme that it needed turning towards the mouth of an actor; most of the dialogue scenes featured two people talking, but I found that hovering the mic above the couples was all that was necessary to pick up both performers' contributions to the dialogue pretty evenly. 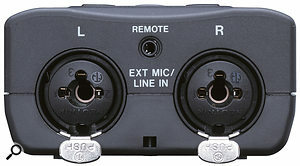 Each time I used the boom mic, I simply connected it to the DR40's mono-specified XLR, set the recorder accordingly and made certain that phantom power was engaged. The only significant problem I had when recording the dialogue was a physical one, rather than anything to do with record settings: when I had the boom in one hand and the Tascam in the other I had no hands left to adjust my headphones! I found I was constantly taking the headphones off to listen to the director (you can't really swing the boom towards the director every time he or she speaks), and then struggling to get them back on again before filming began, so having a belt-clip holder for the recorder would have made matters much simpler. Still, it is easier to see the metering and operate the transport buttons when the recorder is handheld, so there are pros and cons to every situation. Some of the scenes in the film involved two actresses sat at a table talking to each other, and their dialogue was particularly important to the story. But at some point in the proceedings we decided to record their dialogue with the general chatter of the extras in the background. I remember thinking everything through the night before filming and quickly concluding that doing such a thing would be limiting in the edit and made a mental note to insist that we captured clean dialogue on set, leaving the hall noise as something to overdub at the editing stage. Nevertheless, in the heat of it all we started doing otherwise, possibly to give the actors something of a realistic vibe in which to work. After reviewing the audio from the first 'table' scene during a moment's down time, I noticed that at times the background noise was getting dangerously high relative to the dialogue, so we requested quieter chat for the next scene. At one end of the hall was a small stage where a local five-piece swing band were set up to play for the dance scenes, during which the lead actresses would be dancing amid a crowd of people. My advice to the band, who comprised drums, piano, fiddle, trumpet and trombone, was to play in the style of classic records rather than performing specific songs, thereby avoiding potential copyright issues, and fortunately they were very adept at doing so. It was important to get clean audio recordings of their three songs so that the audio could be used behind other scenes where necessary. For this, I set up the GT44 mics some way back from the stage, roughly where the dancers would be, and at head height, to capture a natural balance as would be heard in the audience. The band instinctively adjusted their relative levels, but I had to back off my recording levels quite a bit after noticing that the musicians became significantly louder as they got into the groove. The kick drum, in particular, was very loud. Even though the recorder's limiter was on I made sure that the hardest kicks didn't clip, reasoning that optimising the level was not as important as getting a safe recording. You have to get used to working around the many aspects of a film shoot, some of which could end up taking precedence over the sound recording! In addition to recording the band on their own, I had also planned to capture them playing while the extras danced. However, this proved to be very difficult, the reason being that the DOP was using a filming technique that involved sitting in a wheelchair with his camera and being pushed in circles around the actresses by the lighting technician, to create a smooth, circular camera pan. I found it almost impossible to dodge through the dancers and stay out of shot behind the wheelchair while this was going on, and decided to wait until filming of the dance scenes was done before doing a sound-only recording. Unfortunately, this aspect of the filming was tricky and went on for too long, so in the end there was no time left to make more sound recordings of the band and dancers together. Sound is not usually a top priority during filmmaking and in this instance I didn't get what I felt I needed. I did, however, make a recording of just the dancers' feet, dancing without music, using the boom mic held low to the ground, so that it could be added on to any audio that was eventually used. Ultimately, though, we came a little unstuck with the band recordings. During editing Sam and the DOP discovered that the band had played faster and with more energy and enthusiasm when the audience was dancing, yet this was the audio we had not found time to capture, and so some of it had to be taken from the camera's mic recordings. After the dance scenes and a dinner break, we rushed to complete a number of short indoor sequences before heading outdoors and shooting in the dark, where the value of the DR40's backlit display became very obvious! For this scene the DOP set up across the road so he could frame both the queue of people and the hall, so I had to record from a distance to stay out of shot. The boom mic proved to be surprisingly sensitive and had no problems capturing dialogue; its wind-shielding was also very effective. The scene also included the arrival of a period WWII motorbike, which was incredibly loud, so for that I had to back off the levels, and ultimately the two audio tracks were mixed over a single sequence. My main concern was that it was starting to rain, and my semi-pro gear was not designed for the wet, but fortunately it was able to cope for the short time we were at work. 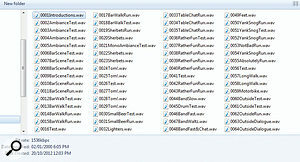 Though it may take some time, it's a really good idea to use descriptive titles for your audio files. As soon as I'd recovered from the dreaded norovirus that I suffered just after filming, I got on with the job of going though the audio files and putting them into some sort of order! Over the course of the day I'd made quite a number of little test recordings to check levels and functionality, so I weeded these out first of all, keeping any that had value in terms of ambient noise. Next I gave each file a suitable name: the file labels given by the DR40 were unrelated to whatever the DOP had recorded on his camera, so there was nothing to lose by replacing them. I used descriptive titles that related to whatever was unique about that particular scene, so that the editors would be able to find what they were after as quickly and easily as possible. Recording sound for a budget film — even a short one — in one day is a challenge and, with the best will in the world, not everything will go to plan. The success of the project depends on everyone turning up, and when many of those involved are there as a reciprocal favour or for relatively little money, there is only so much a director can do to control the situation. Recording the sound inevitably fits in around the filming, and the filming goes hand in hand with lighting. If there are difficulties with either of those processes, there is a good chance that the opportunities to capture all the necessary sound options will diminish. All one can do is be determined and argue the importance of sound with the director whenever necessary, and take every possible opportunity to record. Using expensive equipment is not always necessary, but some projects might demand timecode synchronisation or the lavalier miking of a number of performers, in which case a professional field recorder will probably be required. And certainly anyone intending to make a career out of sound recording will need to invest in gear that is more robust and can withstand all weather conditions. For projects like the one described above, however, a lot can be achieved with a small budget. If you'd like to see the latest edit of the film The Nearness Of You, go to http://vimeo.com/60980670. Overall, director Sam Heydon was very pleased with the audio recordings, but we could still have done better. I asked him what problems he encountered when it came to editing the sound. "When we were filming the crowd scenes I was hoping we'd get a natural sound which we could then edit and maybe reuse in other scenes, but the really natural-sounding conversational stuff happened when people first turned up and were a little bit excited. "The problem is, once you start telling people what to do they don't do it very naturally. Even actors don't give you a good natural burble if you say, 'OK everybody, sound excited.' There is a film called Bird, about Charlie Parker, and some of the tracks on the soundtrack album had excited audience sound but you could hear a mile off that it was just people faking it. Director Sam Heydon. "So, having layered it and looped it a few times I realised that I'd have to add recordings of some other excited people, so I went to a little music club and there were a whole bunch of people giving very vibey chatter, so I recorded that. "For the dance scene Tom recorded very clean, good-quality sound, so we had recordings of the band playing and of people's feet and we put them together, but that didn't sound as good as when everybody was dancing. The extras had been bored out of their minds for about five hours, when suddenly a very good band started swinging, and people were excited. So to get natural sound you have to get people genuinely excited. It was a similar problem with the scene we shot outside. We were trying to get people to sound excited but it was raining and they'd been there all day. "Having complete silence behind the dialogue would also have been useful because at one point the background chat was slightly too loud and we couldn't do anything about it. It's useful to have just a little bit of that just to sit other things on and we thought that if people didn't talk too loud we'd get away with it.